I saw not one but a whole flock of Robins yesterday, returning from their migration to ring in spring. Before long, the chorus of peepers will resonate across the landscape as they come up from the depths of the nearby pond to greet one another and begin their mating ritual. Spring is right around the corner! Left and right plants are emerging from their winter slumber and now is the perfect time to dig biennial plants such as burdock to harvest their nourishing roots. As a few tell tale leaves make their way to the surface, the ground is soft enough, often very muddy and perfect for digging deep to pull those taproots from their depths in the ground. This depth is a great sign of a truly nourishing and tonic herb. Burdock digs deep to draw up minerals making his roots rich with them. Learn not only how you can use Burdock’s nourishing roots for medicine but his leaves and seeds as well! 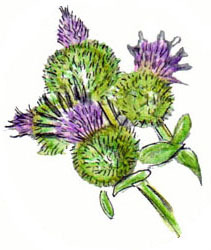 Herb Spirit: How Do You See Burdock? 56 pages from Cover to Resource Page.